We may not have a new version of Android to drool over, but at least we've got more feature-filled, better-looking maps. 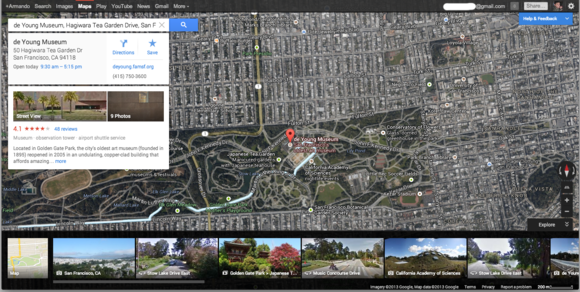 At its Google I/O keynote Wednesday morning, Google announced an enhanced version of its popular Google Maps service. The demos shown on stage drew some applause out of the otherwise listless attendees, and I was itching for the chance to put this improved version of Maps through its paces. After playing around with Maps and virtually visiting several locales around the world, I'm impressed with how much Google has improved its already great mapping tool—though I think the company might have oversold it a bit on stage. The new desktop Maps version looks fantastic: Google has done away with the navigation bars on the top and left side of the screen, dedicating your entire browser window to your map. For the most part, menus are hidden out of sight, which makes the entire interface feel less cluttered. I know there are people who'll miss all the knobs and sliders of the older version, but if you only really use Google Maps to get around, this new layout will fit your needs perfectly. Look up an address or city, and you'll immediately fly to that location with an incredibly smooth and fluid animation. Zooming in or panning around the map is much faster than it was previously, and doesn't require you to wait 30 seconds for all the elements of the map to refresh themselves. Switching between the standard and satellite views still isn't as fast as I'd like, but the 3D models that pop up when you zoom in close no longer look like deformed blobs, and you can actually tell buildings apart. Google, ever trying to find ways to push people into using Google+, has incorporated more social elements into Google Maps. If you search for, say, "Pizza, San Francisco," Google Maps will display pizza restaurants in the area and highlights ones rated highly by Zagat or your friends on Google+. Searching for a restaurant or venue will return Info Cards like this one. The new Zagat feature is helpful for finding out basic information like a restaurant's business hours, location, and phone number, and the professionally sourced Zagat reviews are a step up from the reviews you see on Yelp, where people complain about not getting enough napkins. I'd like to tell you how well the Google+ integration worked, but I don't know anyone who actually uses Google+, and even if I did, I would be suspicious of their tastes. One feature apparently missing in this latest iteration of Google Maps is the ability to determine a user's general location. In the current version of Google Maps, the tool uses various data points, such as your IP address and time zone, to more or less pinpoint your location on the map. Typing "My Location" into the search field will drop a marker over where Google Maps thinks you are at that moment. But I tried the same thing in the new Maps preview and was annoyed that Google Maps could no longer figure out where I was. This meant I had to manually type in my starting point whenever I searched for directions—something I may not always know when I'm traveling. Google told me the feature wasn't available in the preview mode that I tried, but that it would include the capability at a later date. Yeah, yeah, I know I can resort to using my smartphone. But sometimes it's easier to plan things out on a larger screen. Let's hope location awareness rolls out soon. The Explore card shows up when you search for a city or town. Speaking of going to unknown locations, Google Maps' new Explore functionality helps you find points of interest when visiting unfamiliar cities. When you search for a place by name, an additional card appears listing a small handful of suggestions for places to explore in the area. 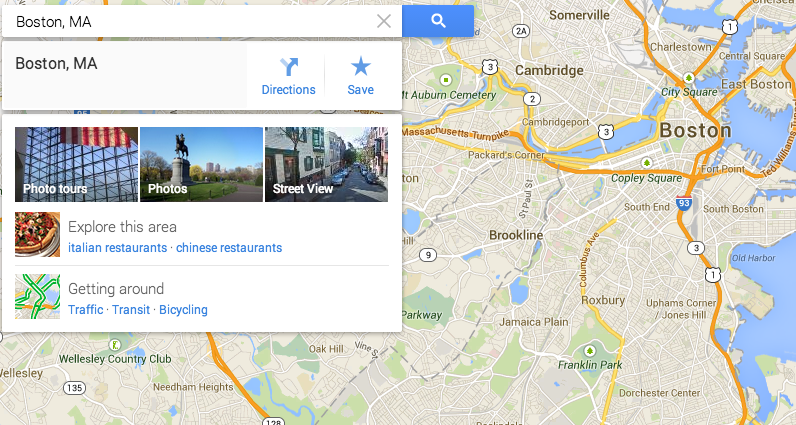 Search for "Boston" and Google will recommend you check out the city's Italian and Chinese restaurants (somehow I think Boston is famous for a different kind of cuisine than what Google suggests). The upcoming update to the mobile versions of Google Maps allows you to explore your location based on various categories, but on the desktop you're stuck with the two or three recommendations that Google decides to spit your way. Now you can explore exotic locales from the comfort of your desk. A more useful way of exploring a location—and one that doesn't involve the lackluster Explore recommendations—is to take a photo tour. 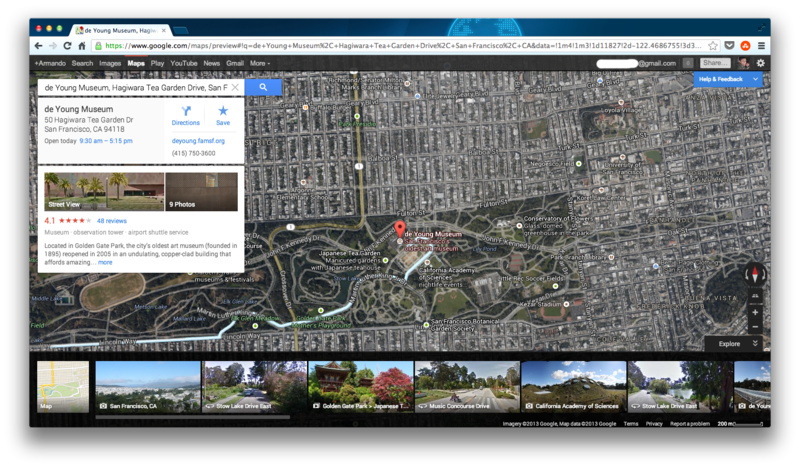 After you search for the place you'd like to investigate, click on the tab on the lower right of the screen. 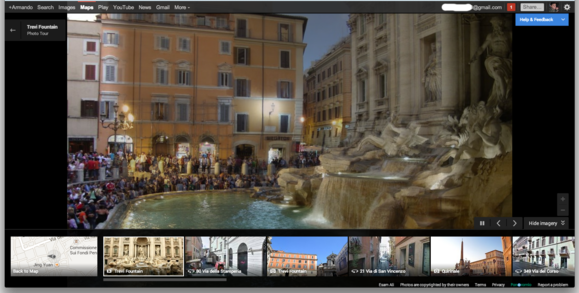 Google Maps will present you with photo tours comprised of images taken by other users at the locale. 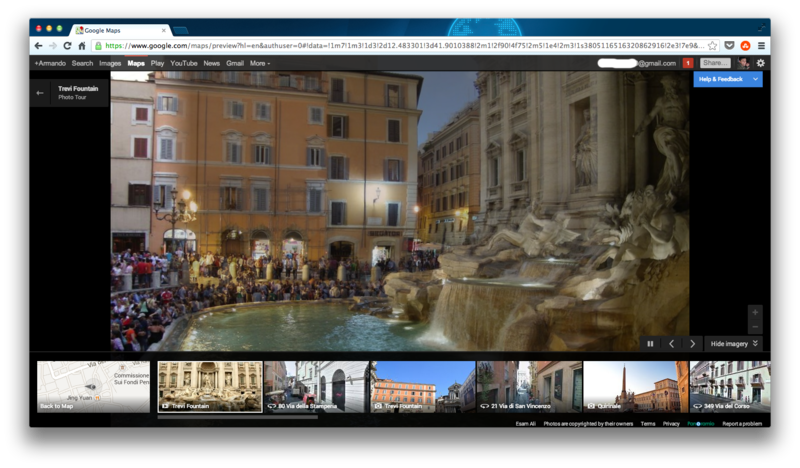 As someone who despises traveling but enjoys taking in new sights, I got a kick out of this feature, as it allowed me to explore places like the Trevi Fountain in Rome without having to deal with the nightmare that is air transport. The new Google Maps definitely has a lot going for it, though it feels like one of those services that's going to stay in beta for a while. While everything worked and I didn't encounter any real bugs, some elements still need their screws tightened down. Google will slowly roll out the update in the coming months and most people should have the enhanced version of Google Maps by some time early to mid-June. Hopefully by then, Google will have any kinks worked out, and Google Maps can go back to figuring out where I am without having to type that information in myself.